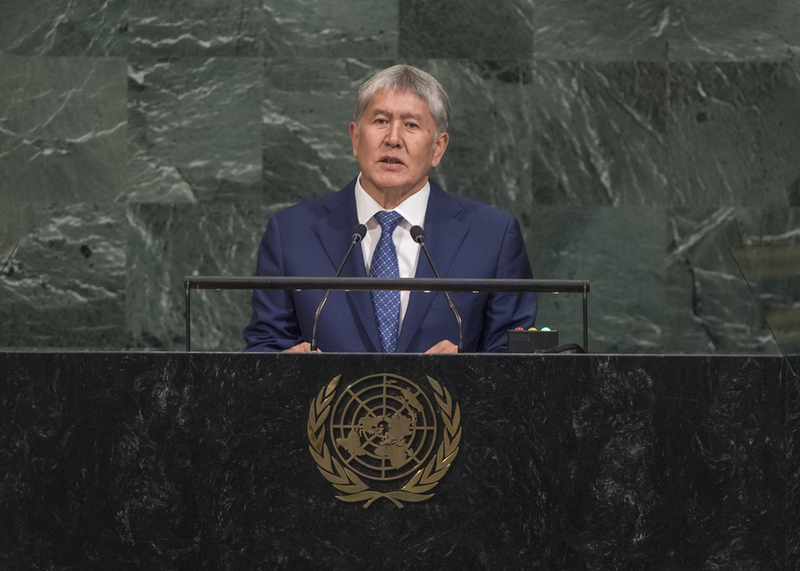 ALMAZBEK ATAMBAEV, President of Kyrgyzstan, recalled that his country had achieved sovereignty in 1991, after which time, it had enjoyed two popular revolutions, demonstrating that the only source of power in the country was its people. Like all other countries that had taken the road of sustainable development, Kyrgyzstan had committed to achieving the Sustainable Development Goals. Human welfare and prosperity were primary goals, despite the impact of the world economic crisis, falling oil prices and the imposition of sanctions. His country had embarked on major projects to improve infrastructure, achieve energy independence and create a stable energy sector. It also aimed to become a transit country and had met its social commitments. Over the last five years, extreme poverty had fallen by 45 per cent, he said, and there had been system-wide efforts to address corruption. No longer were there elite or untouchable individuals in Kyrgyzstan, as had been the case 67 years ago. Today, the Government engaged in dialogue with all international partners and advocated national interests, including regional integration. Kyrgyzstan viewed borders as “doorways for friends”, he said, calling peace the most important achievement in recent years. The country was among the most free and stable in the Euro-Asian region and boasted a strong civil society. Its electoral model, which featured biometric systems, had been used during parliamentary elections in 2015 and last year’s referendum. With presidential elections scheduled for 15 October, he said the conduct of transparent and free polls was critical, as the new Government would continue on a course of development. Further, he said Kyrgyzstan was elaborating a strategy for sustainable development through 2040, aiming to create jobs, ensure social well‑being, raise living standards and promote a parliamentary democracy with a strong civil society. During his recent visit, the Secretary-General had noted that Kyrgyzstan was not just a leader in the region in terms of democracy, but had become a pioneer in creating a digital economy. He expected Kyrgyzstan to become a prosperous, safe country as it approached 2040 with a sense of self-reliance and a high level of development. Climate change was a particular menace to mountainous countries such as Kyrgyzstan, he said, and had impacted all sectors of the economy and increased the frequency of natural disasters, such as avalanches. The destruction of glaciers was another problem, both for Kyrgyzstan and its neighbours. Calling the transition to sustainable development a matter of survival, he said the protection of snow leopards was also critical, as they neared extinction. He expressed concern about divisions created by political and social expressions, noting that Kyrgyzstan had launched various projects to promote intercultural dialogue, including a recent conference on Islam. Prosperity would hinge in part on the effective use of scarce water resources, he said, and regional disputes over water use must be settled through cooperation among the affected countries. The management of uranium stockpiles inherited from the former Soviet Union were a significant threat to the region, particularly as many of them were located near water resources. Terrorism and extremism must be addressed by the international community, particularly as they related to money-laundering and drug trafficking. He condemned recent violence in Myanmar and called upon all parties to engage in peaceful negotiations. More broadly, he urged States to uphold international conventions on non-proliferation, calling for urgent measures to reform the Security Council, taking into account the areas of importance for all States.